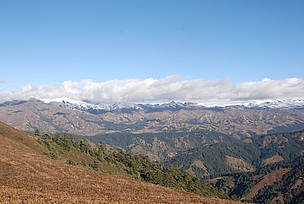 JKSNR, the only strict nature reserve in Bhutan, is a 609.5 km2 trans-boundary area located in the northwest corner of the country. The park mostly covers the administrative jurisdiction of Haa and Samtse Districts. In comparison to other parks, human habitation is slightly less here. The park has an abundant variety of genetic species and ecosystem diversity of global importance. With its tropical to alpine vegetation variation, many species such as Takin, Serow, Red panda, Himalayan musk deer, Himalayan thar, Tiger, Common leopard, Clouded leopard, etc. form the pride of the reserve. Though the area is globally significant, it faces numerous threats towards its sustainability like poaching, illegal felling of trees, fuel wood and timber extraction, excessive cattle grazing, livestock depredation by predators and medicinal/aromatic plants collection.